Angered by a railway workers' strike during rush hour, commuters damaged the trains. Under the Labor Union Law that took effect in March 1946, all workers except police officers, firemen, and prison guards could join labor unions, engage in collective bargaining and strikes without fear of retaliation from their employers. Government employees including schoolteachers, railway workers, communications workers, and regular office workers also organized unions and threatened national strikes to achieve their demands for higher wages. The government reacted by passing the Labor Relations Adjustment Act. This law required a thirty-day cooling off period before public utility workers, public or private, were permitted to strike. In 1948 the government enacted laws that allowed public workers to belong to unions, but prohibited them from striking. 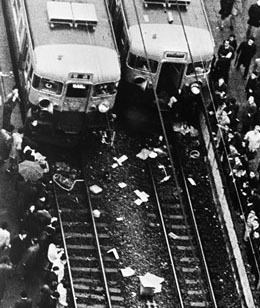 In March, 1973, workers at the Japan National Railways went on their first major strike, stopping trains during the morning rush hour. Commuters at 26 train stations in the Tokyo metropolitan area rioted and damaged trains and train station offices because they could not get to work.